...This chili recipe is a winner! Everyone loved it, and—luckily for them—we will have leftovers tomorrow night! Chili always tastes better the next day! I think there were 2 secrets to the success of this recipe: First, all of the spices were included at the beginning during the vegetable sauté, rather than put in later with the wet ingredients. 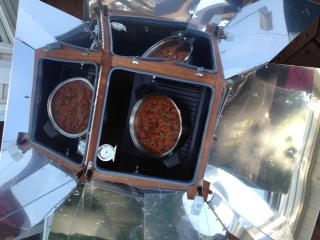 Second, the slow, gentle simmer in the solar cooker worked its magic on this chili. Maybe, if the weather cooperates tomorrow, I will reheat it for dinner in the solar cooker, as well!